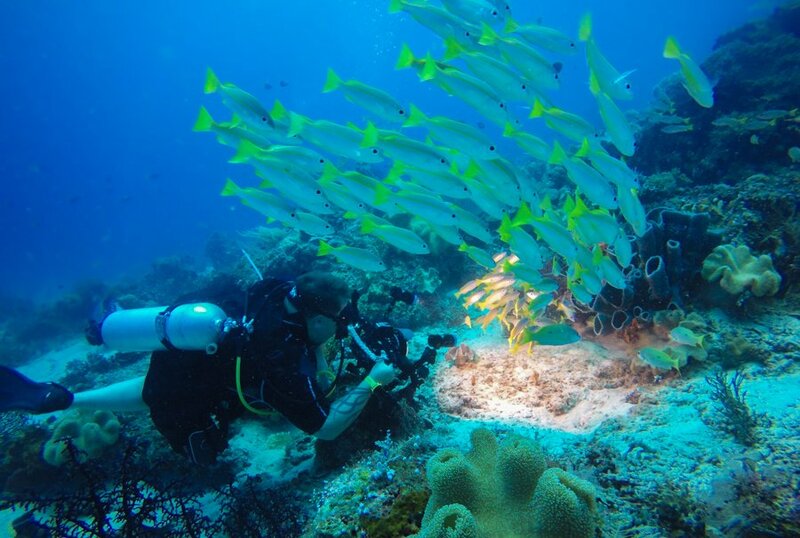 I’ve already written about my time spent scuba diving in Alor, Komodo and Raja Ampat, but they were mostly just detailed guides about how to get to the sites and experience the diving in Indonesia. 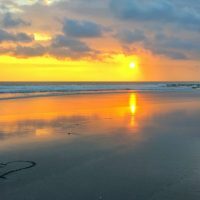 I wanted to write a separate article from my perspective, as a travel blogger, being invited to take part in such an incredible trip. 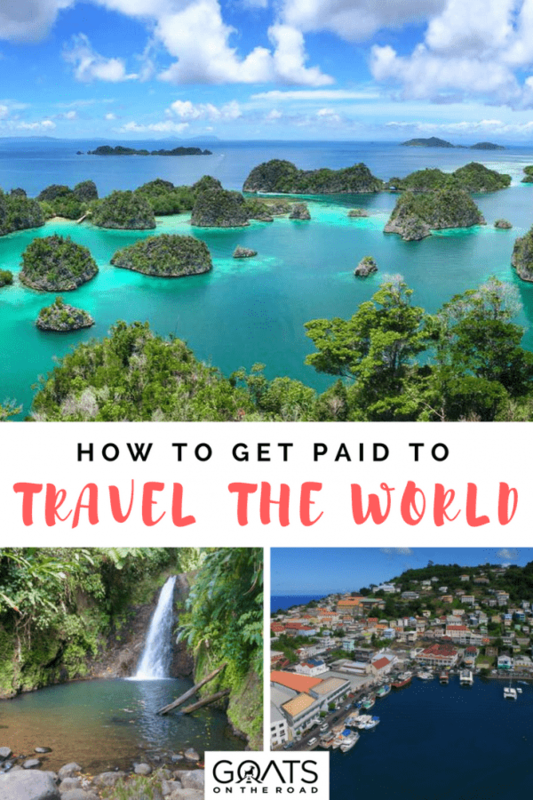 When we first started this blog, our dream was to one day get paid to travel the world, but that dream felt so far away that it seemed to be just that… a dream. In the beginning, our blog grew extremely slowly. I’d check the stats every day to see 10 or 15 people had visited our pages. Over time, as we started writing a lot of guest posts, getting featured on big media sites and properly marketing our blog, it began to grow. 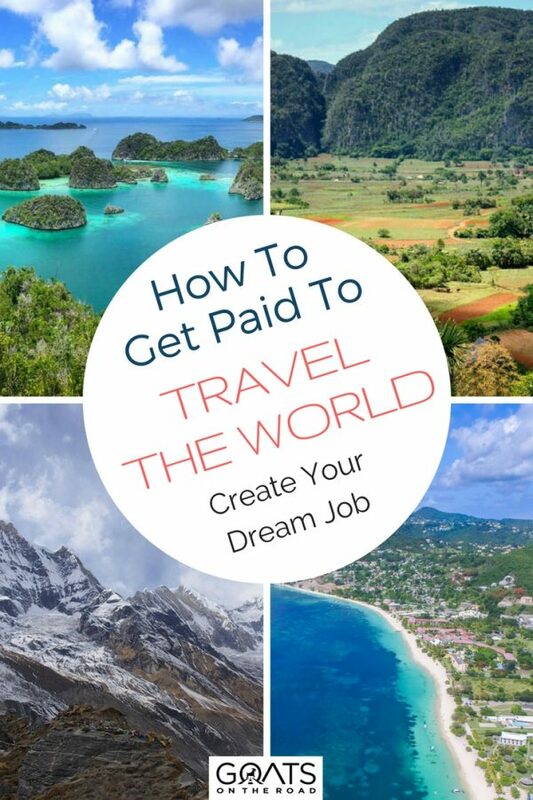 After about 2 years, we started receiving offers to get paid to travel. First it was Mashable who hired us to take part in a campaign they were working on with Cathay Pacific. They paid us a wage and flew us to New York for a weekend spent offline. Since then we’ve worked with the Malta Tourism Board, Discover Kyrgyzstan, Discover New Hampshire, Juicertrip and numerous other brands on paid travel campaigns. Pretty much every single one of these trips that Dariece and I have taken part in have been bucket list travel items for us. They’ve all been extremely well-organized and none of them have felt like an organized tour. We can’t imagine being shipped around a bus with 40 other people, which is how many of these press trips are organized for travel bloggers. We typically turn down any trip that would feel like an enormous tour group. 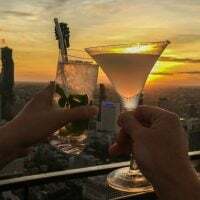 Turning down free and paid trips is definitely a luxury that we never would’ve imagined having when we first started travel blogging. Lately though, it seems that there’s an email in our inbox every month, inviting us to some exotic land on a paid “press trip”. It sounds like it’s too good to be true, and it kind of feels that way too… but there is a considerable amount of work to be done for each trip. We get paid to travel, and in return, we offer a lot of exposure, videos, articles and all forms of digital storytelling for the brands, boards and companies that we partner with. We do our best to share both the positives and the negatives of the places we visit. People always ask us why we want to show people how to start a travel blog. 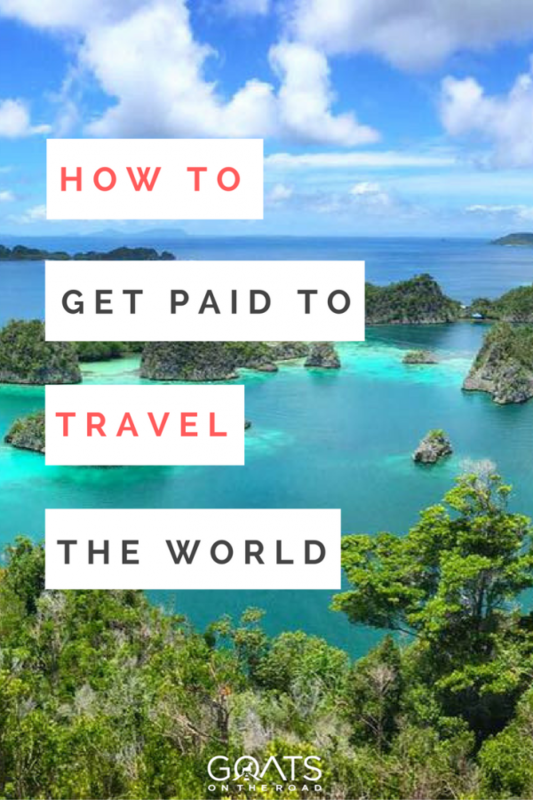 We have it posted all over this website: “Start a travel blog today and get our free ebook that will show you how to grow an audience and earn money online!”. Quite honestly, it’s the best decision we ever made. That’s why we want to help others start a blog to share their stories and information with the world – while being paid to travel and live abroad. Had we not started this blog back in 2012, where would we be? 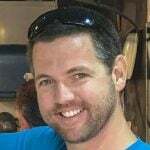 What if we hadn’t read that post by Johnny Ward that inspired us to start blogging? What if we had read it, but never actually followed through on creating Goats On The Road? We did buy that ticket and because of that decision, I was able to take part in the Trip of Wonders 2017 scuba dive trip. Getting invited on experiences like this reminds us just how fortunate we are and how happy we are that our paths brought us here. 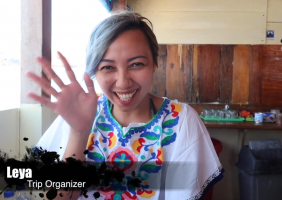 For those who love travel, writing and photography, travel blogging is the ultimate job. This is the best way to combine the things you’re SUPER passionate about, while earning money at the same time. When we received the email from The Ministry of Tourism Indonesia, saying that I was invited to take part in the scuba-focused Trip of Wonders 2017, I was blown away. This was really the trip of a lifetime and it was with an incredible crew of people. 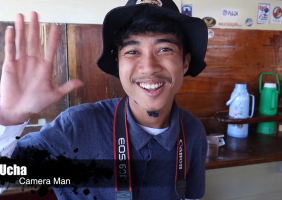 The Trip of Wonders took 10 online influencers to the 3 best dive locations in Indonesia. 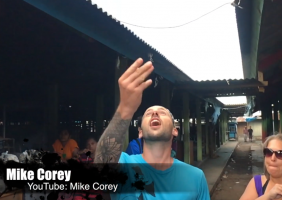 The trip included everything, flights to and from Indonesia, flights between islands, all transfers, accommodation, diving and food… everything. This was all organized by Boulle, a miracle worker who somehow put this whole thing together with his team and it went off without a hitch. 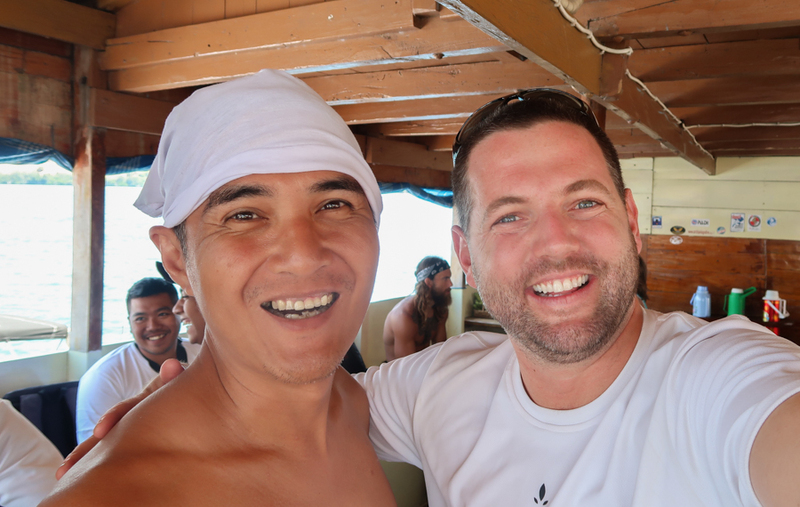 Our trip leader was Pinneng, a hilarious guy from Kupang, Indonesia who we all came to call Dad. There were also numerous people from the Ministry of Tourism who joined the trip at different times. In total, most of the time we were travelling with around 15 people. From the moment the trip started, it was obvious that we had a great crew. Nobody was a diva and everyone was out to have an adventure. We all met for a “welcome dinner” at the Novotel Hotel at the Bali airport and while it was a bit quiet because everyone was jet lagged, it was still fun to meet the group and hear more about our upcoming trip. The first morning of the trip, I had to say goodbye to Dariece. We hadn’t spent more than 48 hours apart in 10 years! This was going to be 12 days and it was definitely a sad goodbye. She stayed in Bali, while I took off on my scuba diving adventure. From Bali I flew to Alor and that morning was the last time I had to carry my backpack. Boulle had the trip so well-organized that we literally didn’t even touch our bags on travel days. We’d leave them outside the hotel room door and the team would pick them up, take them to the airport, check them, and then take them to our hotel room on the other side. We didn’t have to deal with any of the annoying things that typically come on travel days. We flew economy, but enjoyed lounge access at every stopover. What service! Landing in Alor, we hopped on a bus that took us to a local tribe where we witnessed a really cool traditional performance. It felt a little bit “put on” for tourists, but the dancing and the music was beautiful and it was interesting to see their traditional clothing. The next day the diving started. I have to say that Indonesia truly raised the bar for what makes a good dive. In Alor, every dive was phenomenal. 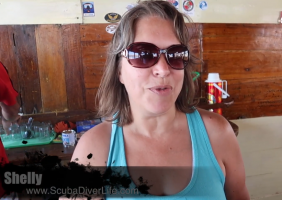 We had visibility up to 30 meters and there were such thick clouds of fish that they blurred my vision and partly blocked out the sun on some of the dives. It was incredible! On one of the dives in Alor, I remember being at around 15 meters and a smile creased my face. Suddenly it hit me. I was being paid to do something that I love. I was being paid to scuba dive. I remember the day (back in 2008) when I got my Open Water dive certification in Thailand and how excited I was. I paid a lot of money for that course and a lot of money on the dives that followed. I would’ve never thought that one day I would be hired by a tourism board and get paid to dive in some of the best locations on Earth. What a job! After Alor we hopped on another flight that took us to Komodo Island. 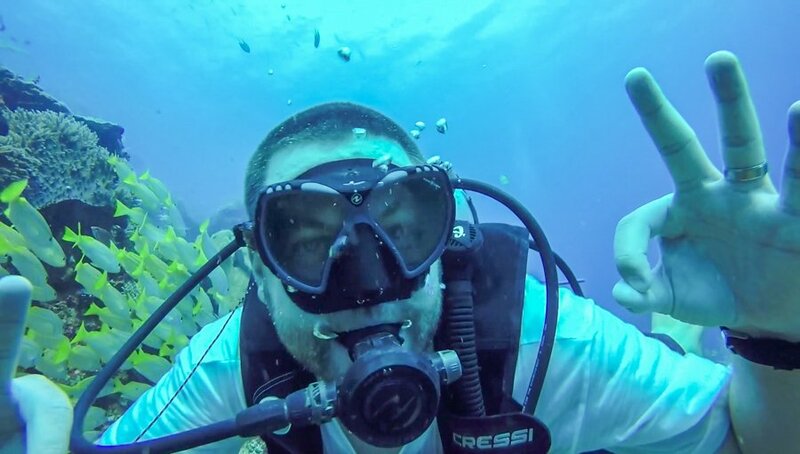 My friend Justin had dived in Komodo in the past and told me that it’s the best diving he has ever done. Justin has done nearly a thousand dives, so it was a big statement coming from him. 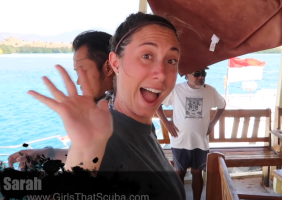 In Komodo we met up with the livaboard dive boat, which is where we were going to live and dive for the next 3 days. I had never joined a liveaboard before, so I was extremely excited to experience it. The boat was awesome. There were plenty of areas to lounge and relax and our cabins even had air conditioning! I was lucky to have my own private cabin and although it was tiny and quite basic (there were no blankets), I was happy that I didn’t have to share a room like some of the other people on the trip. 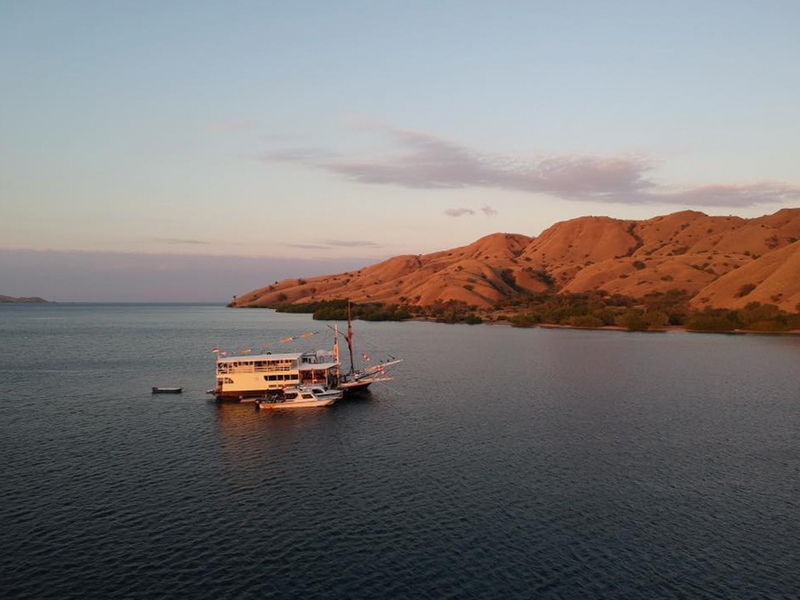 That first afternoon in Komodo we all jumped off the side of the boat, swam, drank a few beers and watched as the sun set over the rippled, curtain-like surfaces of the Komodo Islands. As the sun dipped beneath the Savu Sea, massive bats started emerging from the horizon and their flapping silhouettes flew right over our boat. It was the perfect end to our first day in the National Park. The following morning we woke up at 6:30 (we woke up early every single day on this trip), had breakfast on the liveaboard boat and then hopped on a smaller boat that took us to Rinca Island. This is where we saw the massive Komodo Dragons. Dariece and I visited Rinca Island back in 2009 and not much had changed since then. We walked around the island with a ranger and spotted over a dozen of the 200lb lizards. I’m still shocked at how close the rangers allowed us to get, I could’ve literally poked one of the dragons with my GoPro selfie stick at one point. These things can run at 30km / hour and are able to take down buffalo, so I wouldn’t be surprised if these relaxed regulations change in the coming years. It will only take a few more tourists to get devoured by these lizards before they tighten up the rules (yes, there have been incidents in the past). 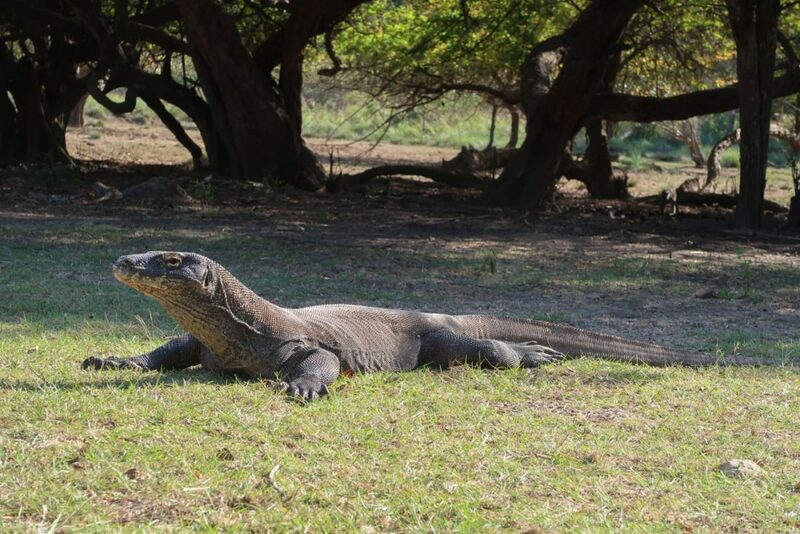 After the dragons, it was back on the small boat to start diving in Komodo. The first dive site was Manta Alley and I was dying to spot a manta ray – an experience that has been on my diving bucket list for years. 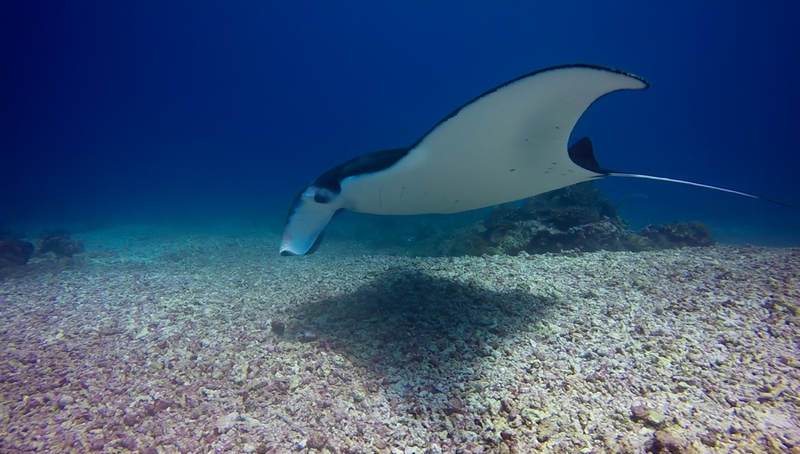 Luckily we saw two enormous mantas on that dive! One of them swam right towards us and as I fumbled with my GoPro to try to hit the record button, I was literally staring down the throat of the 7 foot wide ray. It banked left at the last minute and I have some amazing shots of it (don’t miss the video at the bottom of this post). That first dive was incredible, and they just got better and better after that. 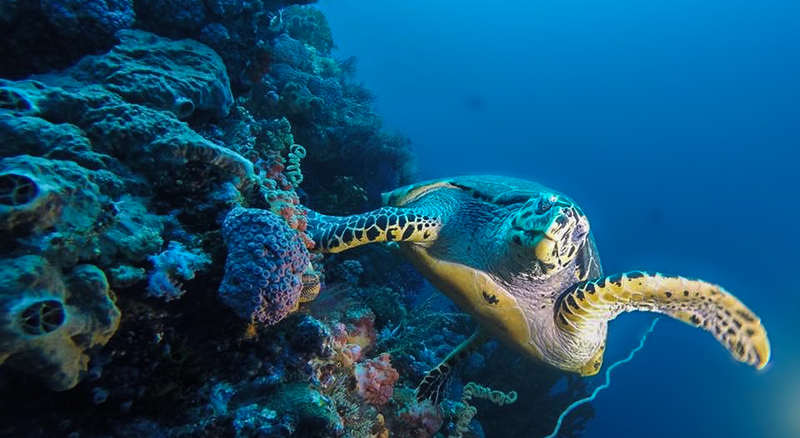 We spotted dozens of turtles, eagle rays, sharks, crocodile fish, octopus and eels in Komodo. The fish life was just as abundant as it was in Alor, but there were so many large pelagic here, so I think it was a better location. On the second night in Komodo there was a night dive scheduled. I had never done a night dive before and I have to say that it’s an eerie, but thrilling experience. We went down with flashlights in the pitch black and spotted sharks, octopus, squid, lion fish and some giant puffers. On the night dive, even if I lost sight of the group for a second, my heart would start racing. There’s something nerve-wracking about being in the middle of the ocean at 18 meters depth, with nothing but a flashlight and the sound of your own breathing. The second morning in Komodo we woke up at 3:30 am (I know… crazy). We all rolled out of bed like zombies and hopped on the small boat that took us on a short ride over to Gili Lawa. We arrived on the beach in the pitch black and started hiking up the highest hill on the small island. I was exhausted, trying to get my body to move when it wanted to be back in bed. I looked up and saw a sky full of stars – the kind that you have to travel far from civilization and light pollution to see. 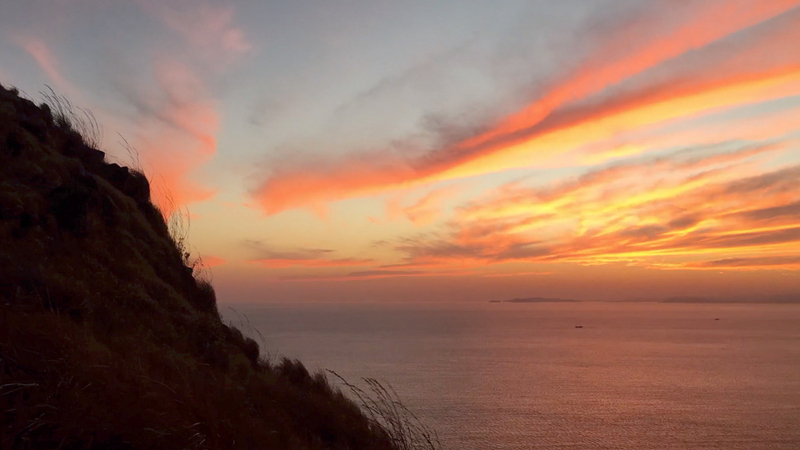 When we reached the top, we all set up our cameras and waited for the sunrise spectacle to begin. When the sun finally started to rise above the sea and illuminate the folded surfaces of the Komodo Islands, I was speechless. I rarely get up for sunrises, but this one was worth every missed minute of sleep. After the sunrise, we had two dives planned and they continued to amaze me. Castle Rock dive site was mind-blowing and we finished Komodo off with another visit to Manta Alley where we spotted one more manta ray. After Komodo we hopped on another series of flights to bring us to Raja Ampat, the final location on the trip. Again we didn’t touch our bags and they were magically placed in our rooms upon our arrival to the Raja Ampat Dive Resort. This was my favourite part of the trip by far. Not only is Raja Ampat a very remote dive location that few people get to visit, it’s also one of the most visually stunning places I’ve ever seen in my travels. Tiny coral crusted islands dot the sea, their white sandy edges diving beneath the calm surface – illuminating the water around them in a brilliant aquamarine glow. Villagers passed by in their small boats looking at our large dive boat with curiosity. They were probably taking their children to and from school – their lives, although passing so close to ours, seemed so far away. We checked into the dive resort and it was my favourite accommodation of the trip. The word “resort” really doesn’t do this place justice. There were 8 funky bungalows sitting right on the sand overlooking the bay. 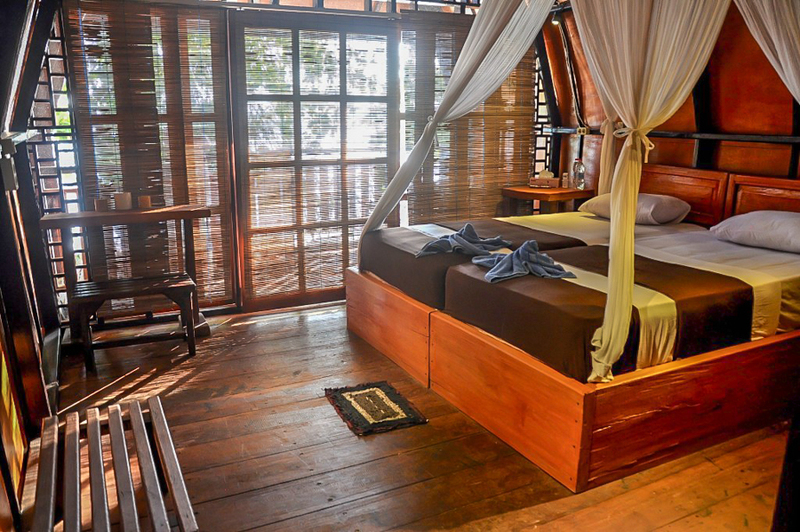 Mike and I shared a room in one of the rustic but modern bungalows. We could literally hear the sea lapping up on the shore just meters in front of our door. A romantic place for two grown men without their girlfriends . 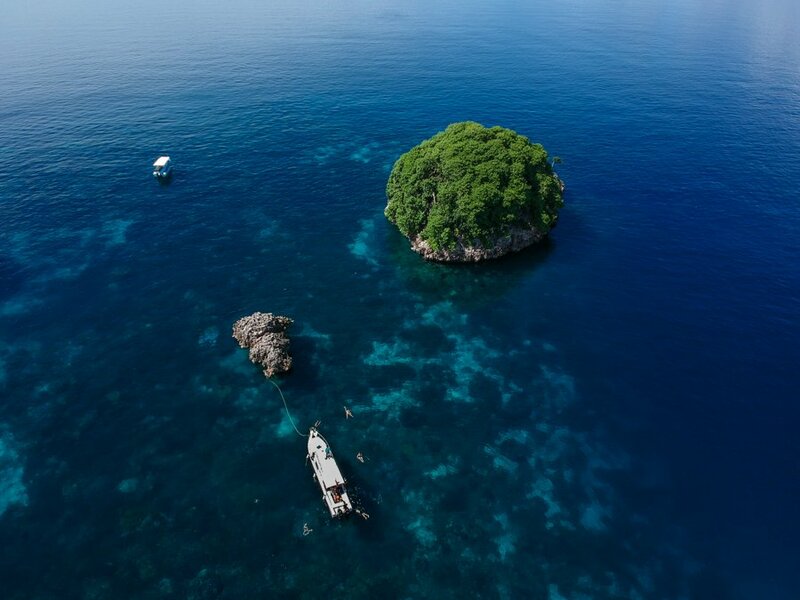 The diving in Raja Ampat was the best on the trip, the accommodation was the best, the above water activities were the best, and Raja Ampat is probably my new favourite place in Indonesia. We did 8 dives around the islands and each one was better than the last. Words really can’t explain what the sea looks like when it’s this rich in marine life. Actually, a world record was set here for the most fish species spotted in one dive – 374! Diving like this needs to be experienced to be believed. 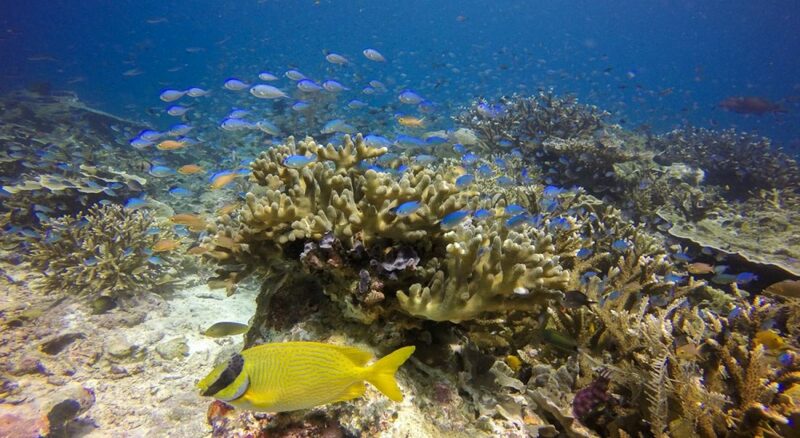 On one day of diving, we also visited the Piyaynemo Islands. This network of tiny atolls attached by white sandbars looks like something out of a fairytale. Emerald waters separate jagged cliffs and sandy shores in this natural wonder of the world. 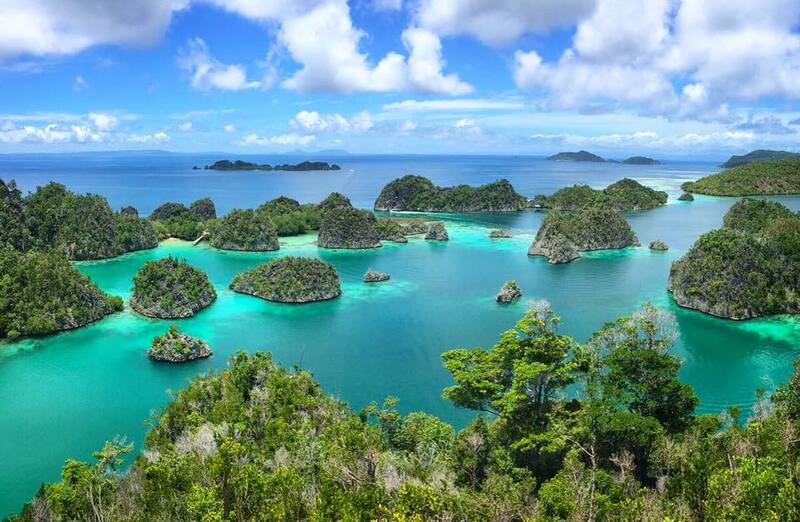 If you’ve ever seen a photo of Raja Ampat, it’s likely from the breathtaking viewpoint at Piyaynemo Island. 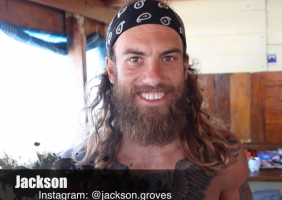 We hung out around the islands for a few hours, flying drones, taking photos and just jumping off of our boat into the crystal clear water. By this time, our group had become really close. We were always laughing, joking and having a great time. We spent every hour of every day together and we got along really well. Each of us seemed to appreciate how fortunate we were to be on such an epic trip. 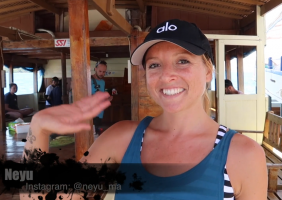 On the last day, Boulle organized a farewell party at the dive resort. He invited some local performers from a nearby village and we all danced, drank beer (and some rum), sang and partied all night. 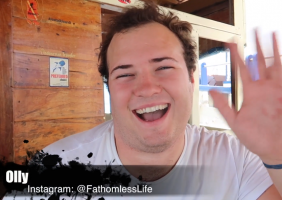 These are the parts of the experience that I didn’t include in the videos that I created or in the blog posts that I wrote because it was a part of the trip that was just for the influencers. The farewell party was an amazing end to a trip that I will never forget. 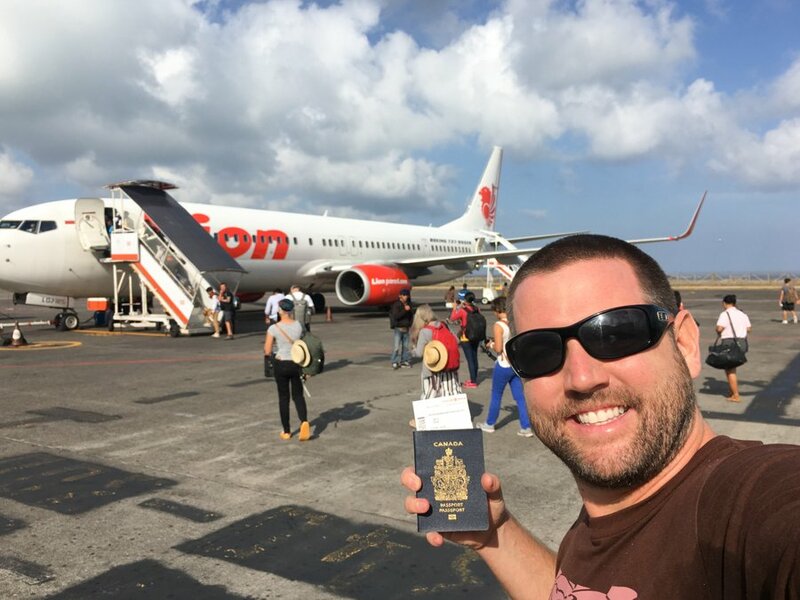 The following day, groggy and hung over, satisfied to have completed such an epic adventure and sad to see the end, we all boarded our final flights back to Bali. I feel so honoured and blessed to have been invited on this trip and I’m so happy that I was able to meet all of these awesome people and see all of these incredible places in Indonesia. I don’t know that I would’ve ever made it to Raja Ampat, Alor and Komodo on my own and if I did, I doubt I could have planned it so well and surrounded myself with such amazing diver friends. I really wish that Dariece was able to dive and take part in this trip and it seems strange to have such an amazing travel memory that I didn’t share with her, but hopefully next year we’re invited again and she can join. If you ever get the chance to visit any of these parts of Indonesia, don’t hesitate. They are spectacular – both above and below the water. Glad we finally got to dive together. Lets do it again soon!